Like every week, today was CSA pick up time. The bag was much heavier then usual, due to a few ears of corn at the bottom of the bag. 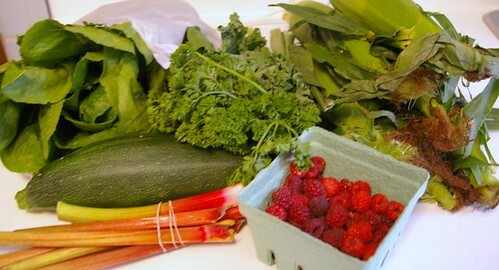 I received some lettuce, kale, parsley, corn, rhubarb and a zucchini. I also got a pick your own pint for raspberries, which I promptly went and picked. I have quite a few scratches on my arms but I also have some lovely raspberries to eat! When I got home I thought that a zucchini quiche would be quite good. I tried finding one without a crust and found this one. It’s in French but I’ll have a translation for you below. Sorry, I didn’t think to take a picture before we had dug in! Wash zucchinis, chop into cubes and reserve. In a large bowl, mix together the flour and half the milk. Stir until homogenous. Add eggs one by one and then add remaining milk. Add salt, pepper and curry. Add cheese and zucchinis. Pour mixture into a 12 inch pie dish (spread zucchini evenly) and add to preheated oven (36oF) for 40 minutes. Note: my pie dish was much smaller so I ended up cooking my quiche for about 1 hour and a half. 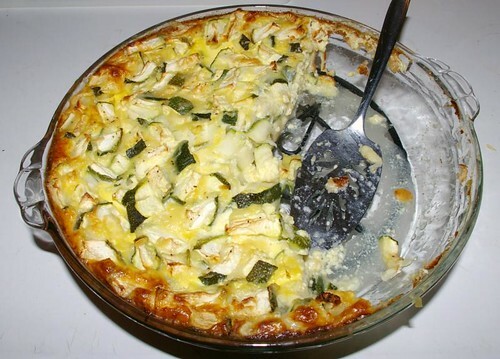 The quiche was still a bit wet, due to the water content of the zucchini but the egg mixture was cooked through. DH wasn’t sure at first but he liked it so much he had seconds! You could add tomatoes, chopped up bacon and customize the quiche any way you like it. Enjoy! oh thanks for the recipe! I should email you instruction on how to cook these yummy potato hash browns with onions on the bbq. my MIL did it for us when they visited last month and it is just So Yum. of course, it includes a bit of salt, pepper and butter. This is what I don’t understand about CSAs. Corn? In July? Either that isn’t local or I need to know where they buy their seeds 😉 Everything else looks great. And I love quiche but never tried the crustless version. Will have to put that on the menu. That sounds really good. And I have a tiny zucchini growing outside my front door. Soon! Hmm. Easy enough to substitute for the flour in this one and make it gf!